College towns are best in the summertime. You'd think they'd slow down in the summer but it's quite the opposite. Summer is the season of patios, festivals, and the farmers market. Plus, once the students leave you can always get a parking space, waits at restaurants aren't nearly as long, and you can enjoy the lake without hundreds of double decker pontoon boats scooting around. If you're looking for a chill summer getaway, check out my guide to Bloomington in the summer. If I can't be on a beach with my toes in the sand and surfing the salty waves a big blue lake will do. I got hooked on paddle boarding when we lived in Hawaii and love having this huge lake ten minutes from town. 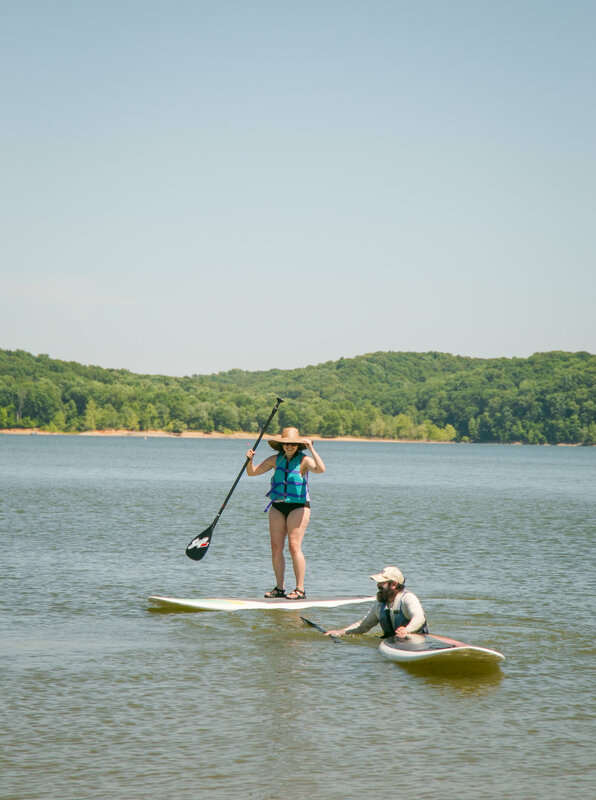 If you don't have your own paddling gear check out IU Outdoor Adventure for rentals. They have a wide variety of gear and it's extremely affordable. Don't want to do the work? You can rent a pontoon or kayak for a day of cruising. The Bloomington Community Farmers' Market is the largest in the state and one of the most popular activities on Saturday mornings. I can't shop if I'm hungry so my first stop is usually Le Petite Cafe on the B-Line Trail for a bite; croque madame and crepes are my favorite. After a snack, meander through the market to do some shopping (and maybe some more eating) and enjoy the people watching. The Farmers Market is open from April-November. My favorite patio in town is Cardinal Spirits, hands down! It's right on the B-Line making it easy to get to by bike and the perfect place to soak up some sunshine and enjoy a cocktail. If you're in Bloomington midweek, Tiki Tuesday is a must and they now offer a full dinner menu seven days a week and brunch on the weekends. Upland Brewing Company is the second oldest brewery in Bloomington and they have one of the best & biggest patios in town. You can often find me here on Sunday afternoons eating pulled pork nachos and drinking beer. If and when you need a break from the sun, head next door to The Wood Shop, their sour brewery. They have about 10 sour taps and 10 specialty taps so its a fun place to try something new. The Wood Shop is one of my favorite places to take people that are new to Bloomington, especially in the summer because you might have the whole place to yourself. Feast Bakery Cafe is my favorite restaurant in town. The menu is crazy good and always changes. My ideal Sunday is sleeping in, coffee, bike ride through Bryan Park to brunch at Feast on their patio. Their other restaurant, Feast Market & Cellar is another favorite and a great spot for wine aficionados. The space is really unique because it is basically a wonderful wine cellar with a killer restaurant. Take time to peruse the shelves and when you choose a bottle you'll pay wholesale prices. When Ryan and I want to get away but don't have time for a big trip, we head to the Charles Deam Wilderness Area. They have miles of trails to explore and plenty of camping spots. This area is seems to be less used than the state parks in the area so if you're looking for solitude, this is the place. For an even more remote camping excursion, try paddling to one of the lakeside camping spots not accessible by trails. For maps and more info click here. Have you been to Bloomington before?